Despite the beefy influx of steakhouses, this place still offers one of the best deals in town. 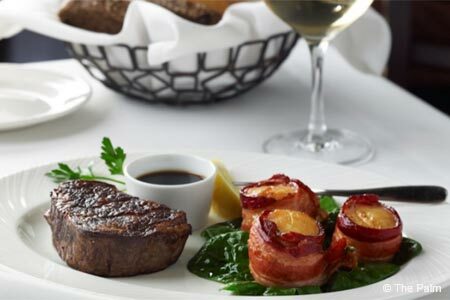 : Gentler and slightly less political than its downtown high-profile cousin, this suburban steakhouse nonetheless puts steaks, prime ribs, and lobsters on center stage for a power meal. But, the kitchen also plays to the lunchtime ladies and dieters with entrée salads and fancy sandwiches. Try the grilled filet mignon with Gorgonzola and arugula for its mass appeal. The beginning breadbasket offers several assortments, and the dessert tray is a must to at least view if not order samples from. Best bet: the Key lime pie, a successfully creamy tart-sweet slice of pastry. Admire the restaurant’s trademark murals, which are caricatures of local, national celebs. Also located at 1225 19th St. NW, Washington, DC, 202-293-9091.